First off – thank all of you for your kind words, positive thoughts and prayers for my recovery that you have sent since my last post. (Announcement) I recently found these words from one of my personal heroes, Margaret Mead: “Sooner or later I’m going to die, but I’m not going to retire,” and I have been inspired to wonder, what’s next? As a follow up to my book, The Boy Who Could Run But Not Walk, I am launching a new section of my website which will focus on practical, age appropriate treatment and therapy options for people who have suffered a brain or nerve injury at or near birth. I hope eventually the content of this blog will be collated into a new book. The blog title 20:4:80 Program references the 20 years parents have to raise their child in preparation for 80 years of life. These 20 years are hard work! But first, parents need to know what works when in the various types of injury. Some approaches are universal, others are more time sensitive, and all of them deliver maximum results when sequenced correctly. The 20:4:80 posts are based on 40 years of experience in the field. I have been blessed by visiting and learning from neuroscientists and master clinicians in many different countries, as well as Canada and the USA. Evidence-based and best practice interventions will be identified when available in the pediatric world. Other approaches, that are not yet studied as intensively in children, will be also presented with the evidence that they work in adults. In my experience, there is often a 10 to 20-year lag in testing and using effective interventions in pediatrics. What about the older child, teenagers and/or adults that were never offered some of these options? In some cases, they were not available and some options had not even been thought of when they were children. For this reason, I will try to also offer suggestions for them as well. Other than the time dependent maturation of the brain limited to children and teenagers, nearly all interventions can lead to improvements for the older individual. Finally, and most importantly, I hope you will share your experiences with me. With each post for the 20:4:80 Program blog, I will ask a question or two with the hope that you will let me know your experience and thoughts on each topic. I am setting up a Private Group on Facebook to facilitate this process. By working together, you can be an important part of change. Informed parents are empowered parents. Knowledge is power at all levels. My purpose is to create a movement for change in my lifetime. What a great title. It has such a clear message. I’m excited to learn & share. Thank you so much from Spain. You are so important in our live! I am very excited for you future projects and sincerely hope that your passion and zest for life is reflected on it. Your book inspired me to achieve so much with my daughter who is 2 years old and has right hemiplegia. Thanks for all the long distance support! Thank you Dr Karen Pape!! Certainly I would like to follow you on your private facebook group. Karen, I would love to participate in your Private Group on Facebook! Link will be up this week. I have a seven year old boy who has double hemiplegia due to prenatal strokes and is also on the autism spectrum. I would love to be in your private Facebook group. How can I get added to the private FB group Karen, I would love to be added. My full name is Ingerlisa Matthews living in Brisbane with the cutest 3.5 year old who is overcoming the limitation of his CP with intense intervention, he is a little warrior for sure. Thanks Ingerlisa, I will be putting up a link for the private FB group later this week. 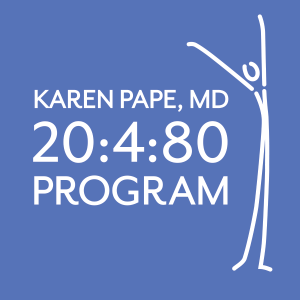 I look forward to having a space to talk about the 20:4:80 Program. Thank you for all the great information you give us. I’m from Ecuador (South América) I have followed your Facebook page and your blog. I have a 4 year old warrior (diplegic Cp).He had SDR at St Louis last year. I would love to join the private group on Facebook so I can learn and share. I am in awe of your commitment , especially at such a crucial juncture in your life. Thank you, thank you, thank you for being a beacon of hope and helping all of us involved in this journey. Sending you much love and light. I’m currently reading you book after seeing a video posted on one of the SDR groups. I would definitely be interested in joining your group too. Thank you for your many years of research and passion into helping so many families. I wanted to take a chance to say thank you! Your book has given me a renewed sense of encouragement. I have a 5 year old daughter with severe CP. Her PT recently stopped her therapy as she felt Emma was not making progress and there was no point. I am convinced that my child can make progress and I am scrambling to figure out where I go from here. You book has given me hope that progress is possible. I would love to be part of your Facebook group! Thanks. There has been a slight delay in getting the FB group set up. It will be up soon. ashley, there is always hope and your child’s brain is still growing and maturing. Give that negative therapist a copy of my book and encourage her to educate herself!